A blast from the past can be seen from the DuSable Bridge, where Michigan Avenue crosses the Chicago River. 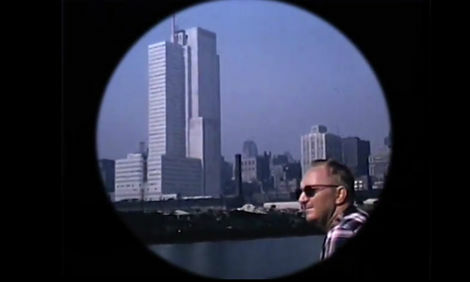 Vintage home movies showing Chicagoans enjoying the water are visible from the bridge, projected on the north-facing portal window of our McCormick Bridgehouse & Chicago River Museum. The feature has been extended through June 10, from 3 p.m. through 10 p.m. Thursdays through Sundays. 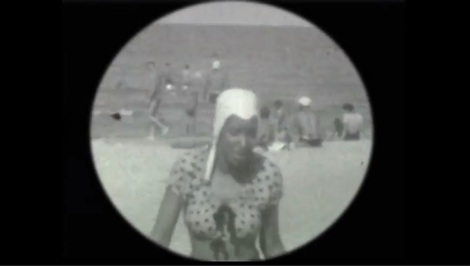 The digitalized home movies from the 1940s through the 1970s showing scenes of the Chicago River and lakefront is part of the South Side Movie Project, an initiative of the University of Chicago to collect, preserve, digitize, exhibit, and research home movies made by residents of Chicago’s South Side neighborhoods. The scenes include a family at the beach, a group of men on a tour boat on the river, a view of the then-undeveloped east side around Navy Pier and more. 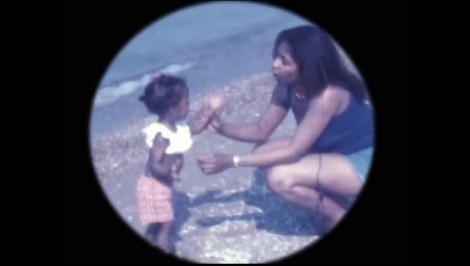 The South Side Home Movie Project’s video was compiled by Project Manager/Archivist Candace Ming. The home movie project is being presented as part of the Tender House Project exhibition of contemporary and adaptive architecture and historic preservation. Curated by Mejay Gula, an adjunct lecturer at the School of the Art Institute, the project features student-created ideas for vacant and forgotten buildings in the city. Exhibited work inside the museum include design proposals from students from the Masters of Architecture program focusing on bridgehouses in the South and North Branches of the river. This “master plan” envisions the Chicago River system as a cultural network. Friends of the Chicago River opened the McCormick Bridge & Chicago River Museum in 2006 to provide new access and understanding of the dynamic relationship between Chicago and its river. A cultural anchor of the new Chicago Riverwalk, it welcomes tens of thousands of visitors every summer. The museum is open Thursday-Monday from 10 a.m. until 5 p.m., from May 12th through October 29th. The museum is closed Tuesdays and Wednesdays. General admission is $6 for adults. Children 6 to 12 years old and students with an ID is $5 and children age five and younger are free. Sundays are free. Founded in 1979, Friends of the Chicago River is an award winning nonprofit organization whose mission is to improve and protect the Chicago River for people, plants, and animals. With over 6,000 members, volunteers, and online advocates, Friends works to make the river greener and more accessible, while building awareness of the benefits that a clean, healthy river can bring to communities across the watershed. Friends of the Chicago River is working to make the Chicago River one of the world’s greatest metropolitan rivers. For more information on Friends of the Chicago River, please visit our website: www.chicagoriver.org.